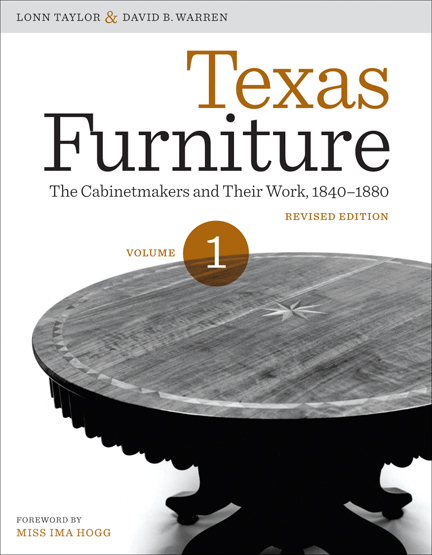 Back in print for the first time in thirty years and thoroughly updated, Texas Furniture is the definitive guide to the state’s rich heritage of locally made nineteenth-century furniture and the craftsmen who produced it. 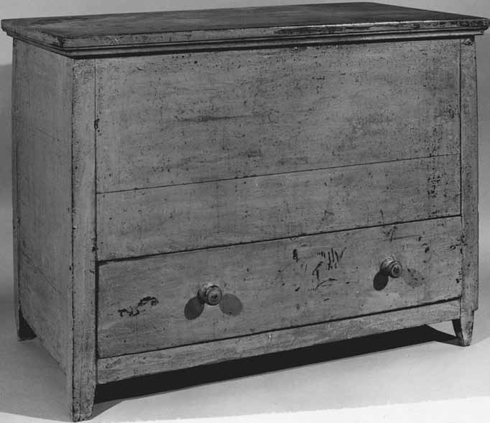 The art of furniture making flourished in Texas during the mid-nineteenth century. To document this rich heritage of locally made furniture, Miss Ima Hogg, the well-known philanthropist and collector of American decorative arts, enlisted Lonn Taylor and David B. Warren to research early Texas Furniture and its makers. They spent more than a decade working with museums and private collectors throughout the state to examine and photograph representative examples. They also combed census records, newspapers, and archives for information about cabinetmakers. These efforts resulted in the 1975 publication of Texas Furniture , which quickly became the authoritative reference on this subject. Now updated with an expanded Index of Texas Cabinetmakers that includes information that has come to light since the original publication and corrects errors, Texas Furniture presents a catalog of more than two hundred pieces of furniture, each superbly photographed and accompanied by detailed descriptions of the piece’s maker, date, materials, measurements, history, and owner, as well as an analysis by the authors. 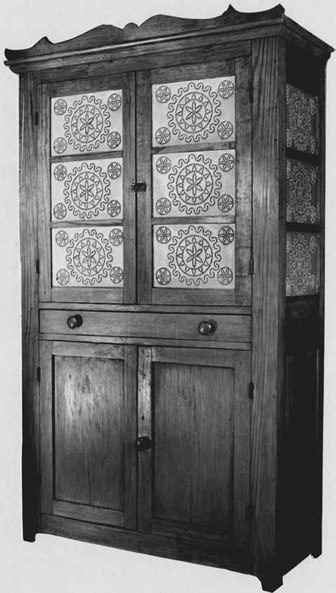 The book also includes chapters on the material culture of nineteenth-century Texas and on the tools and techniques of nineteenth-century Texas cabinetmakers, with a special emphasis on the German immigrant cabinetmakers of the Hill Country and Central Texas. 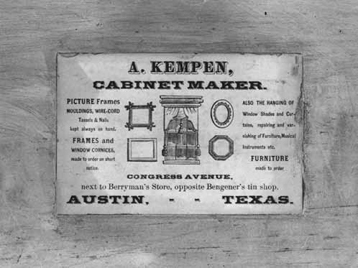 The index of Texas cabinetmakers contains biographical information on approximately nine hundred men who made furniture in Texas, and appendices list information on the state’s largest cabinet shops taken from the United States census records. Lonn Taylor is an authority on the architecture, furniture, and decorative arts of the American Southwest. He had a twenty-year career at the Smithsonian Institution’s National Museum of American History in Washington, D.C., and also served as director of the University of Texas at Austin’s Winedale Historical Center. David B. Warren is an expert on American decorative arts and Founding Director Emeritus of Bayou Bend Collection and Gardens, the former home of Miss Ima Hogg and now a museum of American decorative arts and paintings owned by the Museum of Fine Arts, Houston. Ten years ago a publication on early Texas cabinetmaking would have been somewhat of a surprise to most Texans. Few people would have dreamed that enough pieces of Texas-made furniture could be found to make a serious study of the subject worthwhile. The Index of American Design , first published in 1950, had a few photographs of Texas furniture which were generally regarded as unique. Before this, the earliest and most discerning authority on Texas cabinetmaking, Miss Jean Pinckney of Austin, had begun, with her sister, Miss Pauline Pinckney, to collect and explore the folk art of Texas, its furniture and paintings, as early as 1927. I hardly think they realized, though, the vast quantity and scope of the furniture which existed. And Mr. Ted James of San Antonio could tell a fascinating story of how, over twenty-five years ago, he came to collect furniture in New Braunfels made by Johann Michael Jahn. His search reads like a veritable mystery story. I myself was aware of a West Columbia gunsmith named Dance who fashioned some furniture. There was also a wheelwright, Heinrich Jansen, who made furniture by hand for his family. The Varner-Hogg Plantation house has a charmingly well made cedar four-post tester bedstead made by him, the gift of his grandson, Philip Gupton. Fredericksburg had several well-remembered furniture makers, the most prominent of whom was Johann Peter Tatsch. In Washington County, I had purchased a locally made naïve bed of Southern ash, as well as a really sophisticated walnut slant-top desk. It had never occurred to me to look further. When the Winedale Museum was dedicated in April, 1967, Dr. Charles van Ravenswaay, director of the Henry Francis du Pont Winterthur Museum, was one of our distinguished guests. 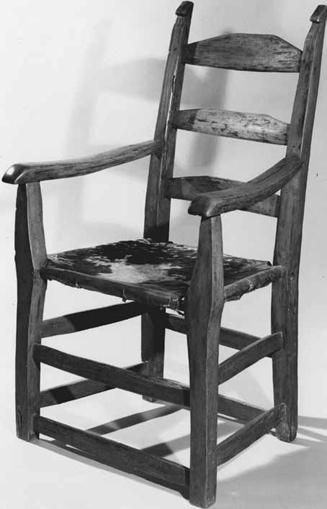 Upon learning that one of the former owners of the museum property, Mr. Lee Wagner, had some furniture made in the vicinity of Round Top, Dr. van Ravenswaay was anxious to see the pieces. He found a table and chest of drawers, very well designed and made, of a style influenced by the Central European Biedermeier period. From these pieces and from Dr. van Ravenswaay's appreciation and remarks, the idea for a book on Texas furniture was born. Dr. van Ravenswaay had made a study of the German trek up the Mississippi Valley. 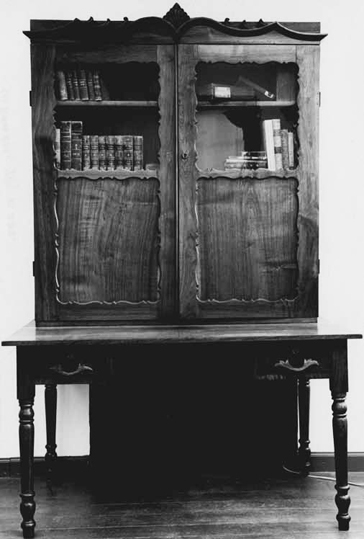 His findings stimulated my curiosity about Texas and prompted me to approach the University of Texas Press to see if there would be interest in publishing research on early Texas cabinetmaking. I suggested a many-sided approach to the subject, with consulting editors who were expert in cabinetmaking and well versed in the history of the early settlers in Texas. The Press approved the plan and consented to publish such a work. This was nearly seven years ago. We thank the Press staff for their encouragement and patience in waiting these many years for the completion of our material. My part of the work was preliminary and started at once from scratch. First, we appealed to Dr. Chester Kielman, director of the archives at the University of Texas, for certain census lists from 1850 through 1870. We began with the lists from the areas in Texas where immigrants from Central Europe had settled. As the project expanded, we read every census list from every county in Texas. We found that men who made furniture were registered not only as cabinetmakers but also as wheelwrights, carpenters, builders, and so on. We tried to trace their descendants by name. We inquired whether they had examples of any pieces made in the family. Our success was gratifying. We asked for and received snapshots as well as answers to a detailed questionnaire. As the snapshots arrived, we slipped them into albums and made a card index file with pertinent information given from the questionnaire. Some pieces pictured appeared primitive, others sophisticated; all had charm and showed a creative quality, with an innate attempt to make something of beauty. Furniture and amenities often had to be made in Texas, since the immigrants from Europe—and the Anglo-Americans, too (who had come to Texas earlier)—had arrived either by sailing vessel or by covered wagon, with little space in many cases for more than the family trunk. At that time Texas was a frontier territory, rough though enticing for those seeking a home with expanse of land. The time soon came when we had to consider the heart of the book, the background history of the immigrants and the early settlers in Texas. Many facets of furnituremaking would have to be investigated. Two obvious scholars were at hand. Mr. Lonn Taylor was a natural, a professional researcher and editor, director of the Winedale Museum of the University of Texas. Mr. David B. Warren, then curator of the Bayou Bend Collection of the Houston Museum of Fine Arts and now associate director of the museum, was an authority on furnituremaking, especially the furniture of the United States. We sought to have the publication a joint effort of the Winedale Museum of the University of Texas and the Houston Museum of Fine Arts. Mr. Mike McLanahan, president of the Houston Museum of Fine Arts, when approached, readily consented, seeing at once the prestige which would accrue to the museum if Mr. Warren were to take the necessary part. Mr. Taylor agreed not only to do the research and writing but also to act as editor in chief. Mr. Warren agreed to do the analyses of the furniture and supervise the actual photography. Since we started our book, much general interest has recently been engendered by the brilliant exhibition on Texas cabinetmakers by the Witte Museum of San Antonio in 1973 and by the publication of the catalogue of this exhibition. We wish to express appreciation for some important early research given Mr. Taylor by Mr. James McReynolds of Nacogdoches. No endeavor upon which I launch can ever come to fruition without the counsel and assistance of my invaluable secretary, Mrs. Jane Zivley.